Quashing the political ambitions of jailed ex-Bangladesh Prime Minister Khaleda Zia, the election authority on Sunday rejected her nomination papers from three constituencies, citing her convictions in two corruption cases. The Election Commission‘s decision came four days after the Bangladesh High Court ruled that a person jailed for more than two years cannot contest polls. 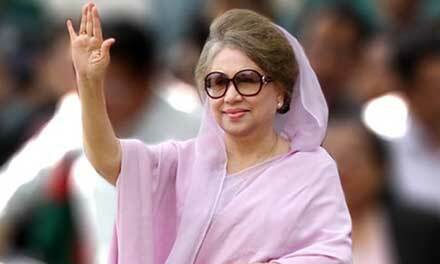 73-year-old Zia is currently serving jail terms in two graft cases involving charities named after her slain husband Ziaur Rahman. She had filed nomination papers from three constituencies — two from northwestern Bogra and one from southeastern Feni — for the December 30 polls, but the returning officers of the two districts scrapped her nominations as she was convicted by the court, an EC spokesperson said. Nearly 104.2 million people, including some 51.6 million women, are registered as voters. They will elect 300 representatives to Parliament through the balloting in about 40,199 polling stations. Zia has been in custody since February 8, when the Dhaka Special Court convicted her in the Zia Orphanage Trust graft case and sentenced her to five years of imprisonment for embezzling 21 million Bangladeshi Taka (USD 252,504) in foreign donations meant for the Trust. On October 30, the High Court doubled her jail term to 10 years. On October 29, a trial court convicted her in the Zia Charitable Trust graft case and sentenced her to seven years in prison and imposed a fine of Tk 1 million (USD 12,024).